Once you master the plain side hop from a trackstand, try it out from a standing position on the rear wheel. 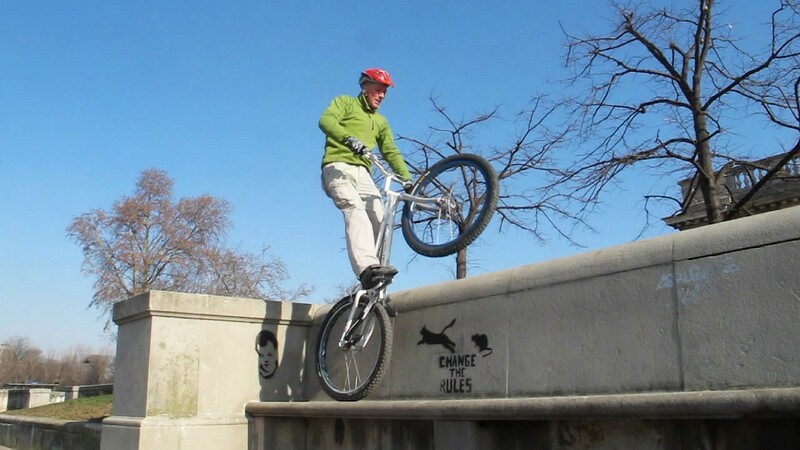 Of course, you must be able to hop at least once on the back wheel before you can tackle this variant. Kenny Belaey took off from a rear wheel position, lands rear wheel first. Rick Koekoek's raw power delivered in a split second. With time and experience, the rear wheel side hop will give you more control and flexibility as you will be able to position your bike very precisely on its rear wheel, especially when there isn't room to rest the full bike on both wheels. Starting in balance over the rear wheel also means that you are positioned higher up on the pedals, which is a big advantage in terms of weight transfer from your take-off position to your landing target. 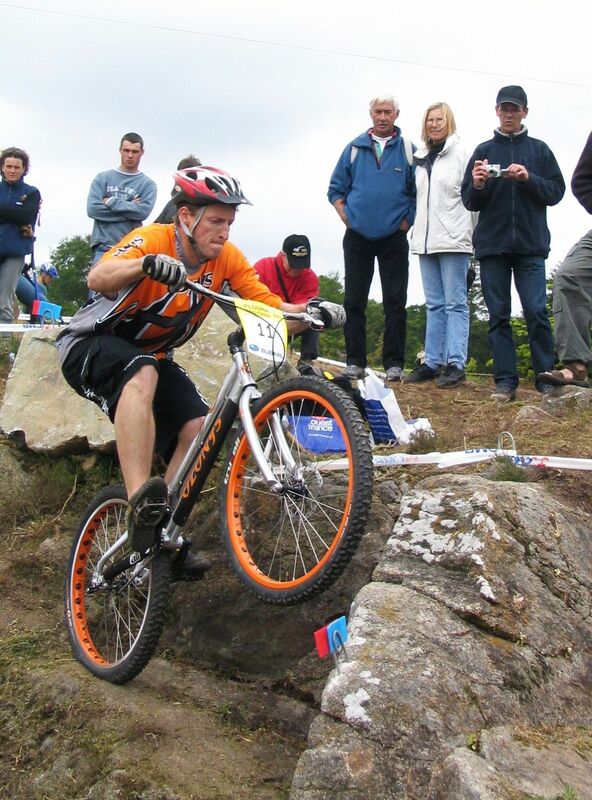 The technique is very similar to performing a pedal hop, except that you must concentrate your impulse upward and try to amplify the bouncing effect of the rear tyre. It is often easier to learn this side hop on your lazy foot side. Ramiro Aramburu just about to secure both wheels. 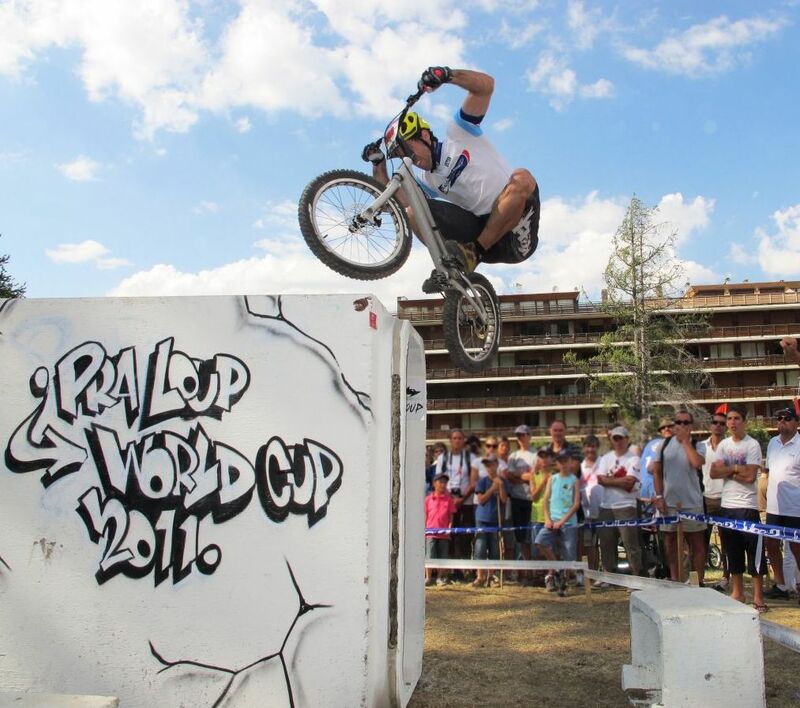 Benito Ros tucks sideways to land his bike over the obstacle. 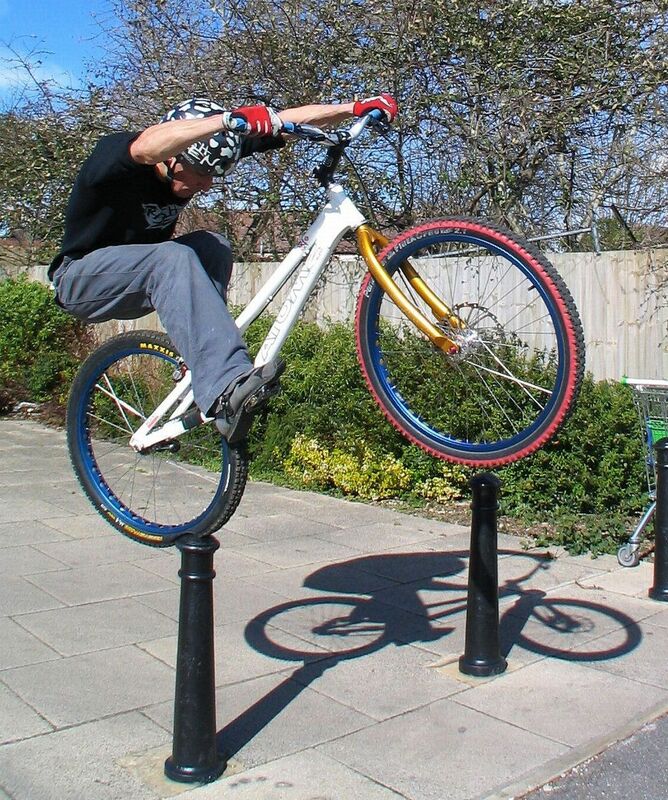 Adjust your rear wheel position and find your balance standing on the optimum spot for take-off. This may be a flat surface, free of recesses, or a small bump that positions you higher and nearer to the obstacle. When stabilised with the rear brake locked, flex your knees and arms to drop your centre of gravity. As you crouch on the bike, lower slightly the front wheel so that you end up with your arms nearly stretched and your bum right over the rear wheel. This will give you more torque and power for the kick. Use this compression phase to pre-load the front pedal. Once at full compression, spring up into a full jump. Land to rear wheel then there is no alternative. The front wheel hardly moves as you pull yourself up on the handlebars to boost your impulse. Maintain pressure on the ground as you move up on your front pedal and finish up with a firm pedal kick as you reach the full extension. Skew your impulse sideways by leaning your shoulders slightly over the obstacle, away from your strong foot. Tuck your knees up to carry on with your upward momentum, pulling on the handlebars to lift the bike up with you. Like in a bunny hop, you will end up fully tucked in mid-air, your arms pulling high but with the bike standing pretty much vertical. Lock the rear brake before you land with the back wheel first, and make any necessary correction hops before your next move. 1° Adjust your rear wheel position and find your balance on the optimum spot for take-off (for tyre compression, a bump is better than a recess). 2° When stable over the rear wheel, flex your knees and arms to drop your centre of gravity. As you crouch, lower slightly the front wheel. 3° At full compression, spring up into a jump on top of your front pedal, pulling yourself up on the handlebars to boost your impulse upwards. 4° Maintain pressure on the ground as you move up on your front pedal and finish up with a firm pedal kick as you reach the full extension. 5° Tuck your knees up to carry on with your upward momentum, pulling on the handlebars to lift the bike up with you. 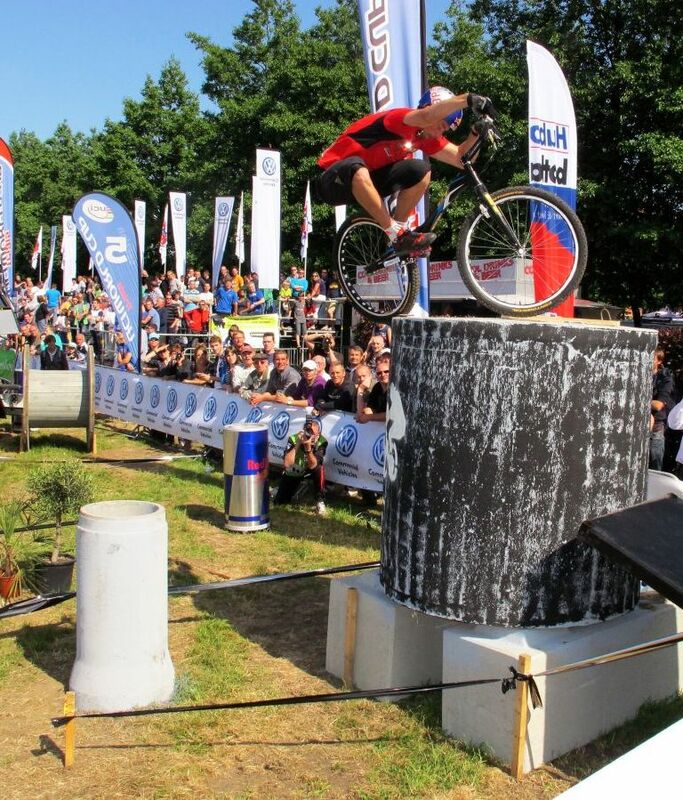 6° You will end up fully tucked in mid-air, your arms pulling high but with the bike standing pretty much vertical. Lock the rear brake. 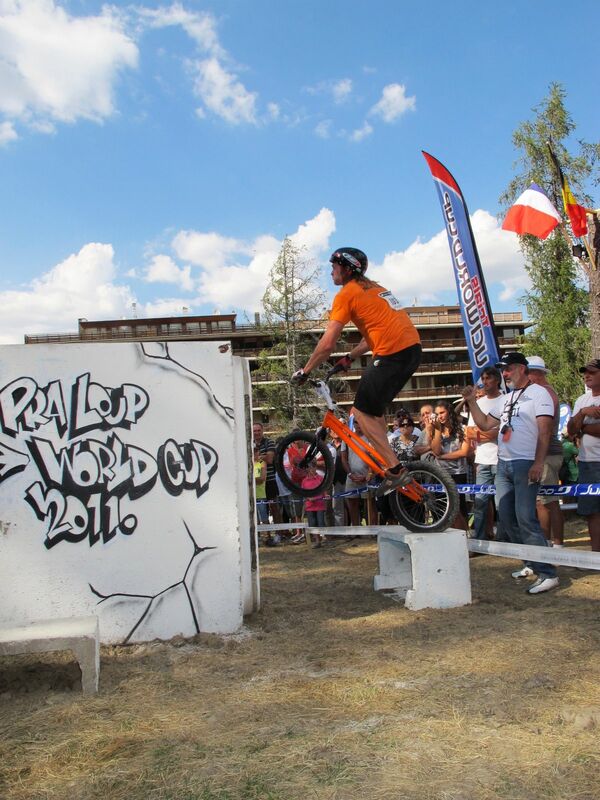 Bruno Arnold during a compression hop, ready to pull on the bars. Vincent Hermance lands a precision side hop. Starting already in balance on the rear wheel can give you more power for the pedal kick, especially if you amplify the bouncing effect of low pressure tyres by crouching down swiftly before your pedal kick. You will have more power up if you keep your arms stretched during the jump extension, pulling the handlebars to your abdomen to leverage the frame as a cantilever (this will give you more lift). One way to further amplify the bouncing effect prior to the jump is to stretch your legs and point your feet down to raise yourself up on top of the pedals, just before you crouch and flex your ankles. 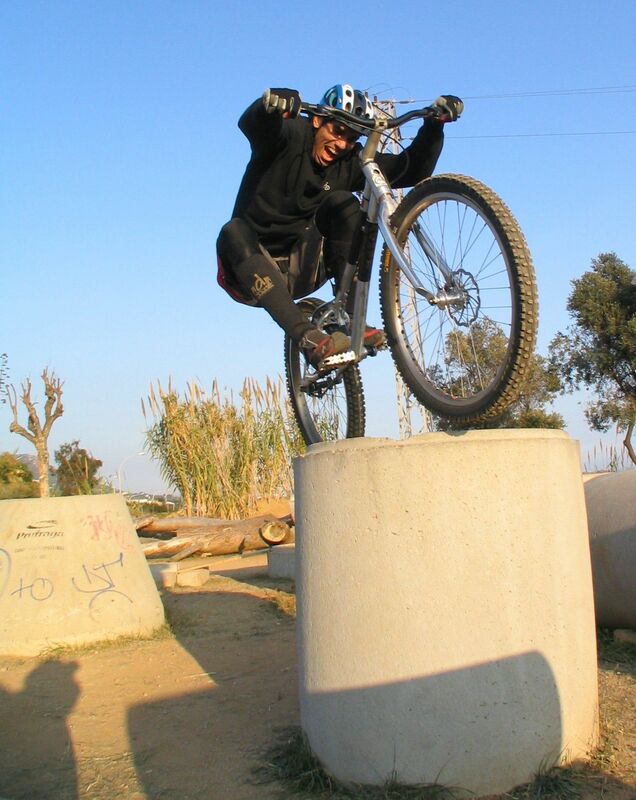 Some riders even hop once to gain extra height and boost the compression phase before springing up. It is easier and safer to climb at a slight angle towards the obstacle, rather than parallel to it. This ensures a wider intersection area (more grip) between the rear wheel and the edge of the obstacle. Learn on a small kerb and build it up. 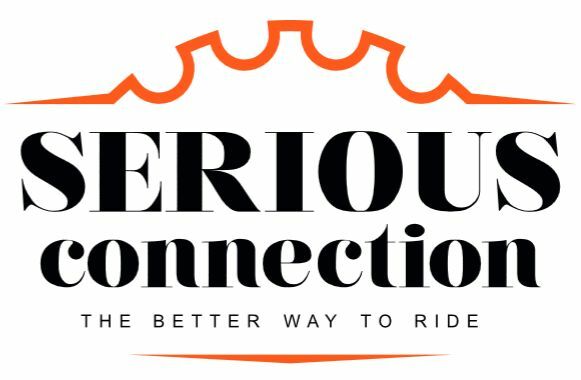 Once you get the hang of it, challenge yourself on stairways, side hopping one step after another on the rear wheel, without resting the front wheel. 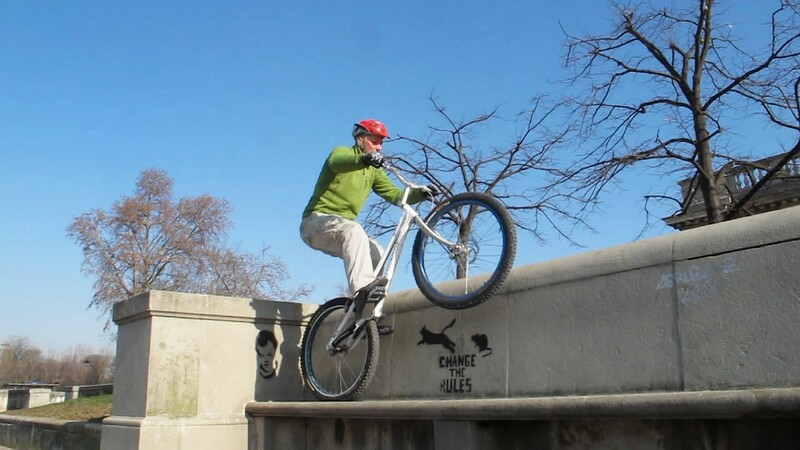 Before you side hop directly onto narrow edges, plan your exit strategy, most probably a pedal hop or a back hop. 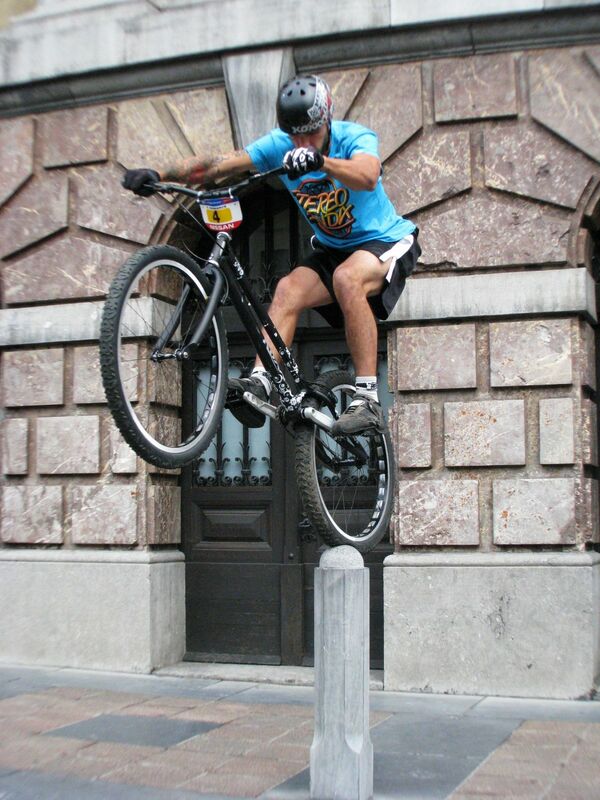 On obstacles large enough for the whole bike to land, try to land both wheels at the same time to maximize your grip.